After sunset on December 8, 9 and 10, 2018, it’ll be a challenge to spot Saturn near the young moon. Find an unobstructed horizon in the direction of sunset on these evenings, and start your search no later than about an hour after sundown. Both the moon and Saturn will quickly follow the sun beneath the western horizon. Will you see them? Maybe. Binoculars could come in handy. Around the world these next several evenings, Saturn sets about 1 1/2 hours after the sun. The moon’s setting time will vary considerably, depending on the date and your place on the globe. From everywhere worldwide, the moon will be easier to catch on December 9 than December 8. It’ll be easier still on December 10. That’s because, day by day, a wider (yet still very slender) waxing crescent moon will be higher up in the sky at sunset and will stay out longer after sundown. Note that – on December 9 and 10 – the illuminated portion of the moon will be pointing toward Saturn. Click here to find out when the sun and moon set in your sky, remembering to check the Moonrise and moonset box. New moon was December 7. It happened at 7:20 UTC; translate UTC to your time. 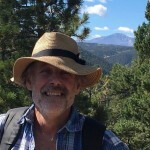 For time zones in the contiguous U.S., that places the time of new moon on December 7 at 2:20 a.m. Eastern Time, 1:20 a.m. Central Time, 12:20 a.m. Mountain Time – and on December 6, at 11:20 p.m. Pacific Time. So, as the sun sets over North America on December 8, the moon will be over 1 1/2 days old. And that’s a very young moon. 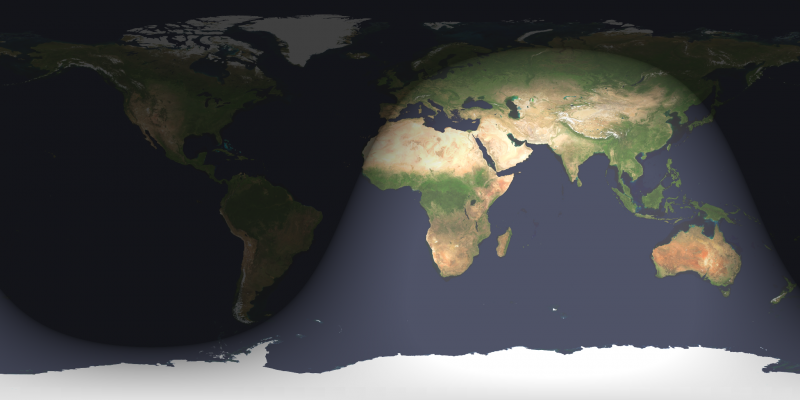 Take a look at the worldwide map below depicting the day and night sides of Earth for December 8, at 7:20 UTC (precisely one day after new moon). The shadow line passing through Northeast Asia, Japan and to the east (right) of New Zealand shows where it’s sunset when the moon is just one day old. Thus, for Asia and Australasia, it’ll be tougher to see the moon on December 8. Day and night sides of Earth on December 8, 2018, at 7:20 UTC (one day after new moon). Worldwide map via the U.S. Naval Observatory. Earth will keep spinning. The minutes will tick by. The moon will move eastward in its orbit, as it always does, putting distance between itself and the sun on the sky’s dome, and shifting more of its lighted half or day side in our direction. By the time sunset arrives for the Americas on December 8, the moon will be over 1/2 day older than at sunset on December 8 in Asia. That means the moon will be easier to see. Likewise, each day, the moon will move farther away from the setting sun on the sky’s dome to stay out longer after sundown. Full moon will come again on December 22. 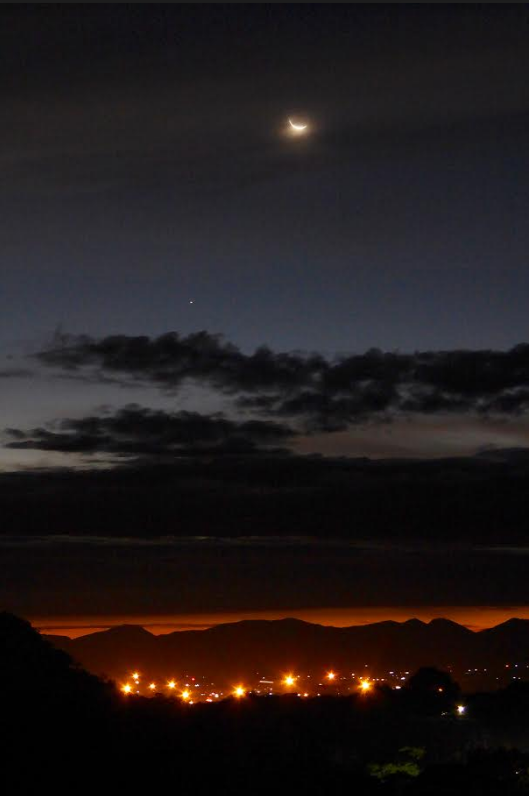 Peter Lowenstein of Zimbabwe caught the young moon and Saturn after sunset on December 9, 2018. Thank you Peter! So the moon is due to wax in phase and become more prominent in our sky, over the coming two weeks. Saturn, in the meantime, will be sinking closer to the glare of sunset day by day. One evening soon, you’ll look for it and it’ll be gone, behind the sun. 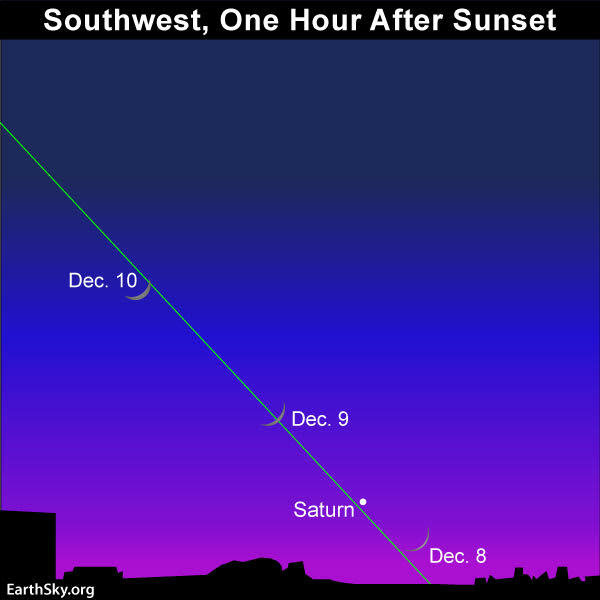 So, while the time is at hand, use the young moon to find Saturn an hour or so after sunset on December 8 or 9. Note that on December 10, the illuminated portion of the moon will be pointing toward Saturn. Bottom line: Use the young moon to find Saturn after sunset on December 8 or 9, 2018. On December 10, the illuminated portion of the moon will be pointing toward Saturn.